Using its innovative gas sensing technologies, Figaro Engineering globally provides cost-effective gas sensing solutions for a wide range of applications in the fields of home and personal safety, industrial safety, air quality control, HVAC, home appliances, and the automotive industry. Figaro's advanced high-volume production facilities stand ready to meet all your gas sensor needs. Gas sensor has high sensitivity and selectivity to hydrogen gas. This sensor can detect hydrogen gas with a concentration of 30-1000 ppm. The sensor is resistant to high temperatures (ceramic base), and suitable for the application of hydrogen gas detectors. Gas sensor that can detect hydrogen sulfide gas with a concentration of 5-100 ppm. The sensor is resistant to high temperatures (ceramic base), and suitable for the application of Hydrogen Sulfide gas detector. Made of ceramic gas sensors that can detect ammonia gas with a concentration 30-300 ppm. The sensor is suitable for cooling the gas leak detector applications. Made of ceramic gas sensors that can detect concentrations of gas Halokarbon 100 - 3000 ppm. The sensor is suitable for applications Halokarbon and gas detectors detect gas leaks coolant. Gas sensor that has a high selectivity for water vapor at concentrations of 1-150 g/m3. The sensor is suitable for automatic control applications in the microwave. Gas sensor that detects the engine exhaust of gasoline and diesel engines at a concentration of 10-1000 ppm and 0.1 to 10 ppm. The sensor is suitable for ventilation control applications (exhaust gas) in vehicles. Gas sensor that can detect Monosida Carbon (CO) at a concentration of 30-1000 ppm. This sensor has a compact size and low sensitivity to hydrogen gas. 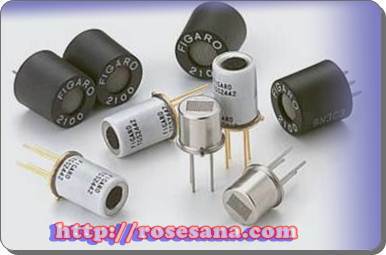 These sensors are suitable for CO gas detector applications in the home. Gas sensor that has a high selectivity for ammonia gas. This sensor can detect ammonia gas at a concentration of 10-100 ppm. Low power consumption of this sensor. The sensor is suitable for ventilation control applications in agriculture and livestock industry. Gas sensor has high sensitivity to air pengkotor at concentrations 1-30 ppm. The sensor is suitable for the control of indoor air quality. Gas sensors are sensitive to VOC (Volatile Organic Compound) and foul odor at concentrations of 1-30 ppm. The sensor is suitable for application control of indoor air quality. Gas sensor that has a high selectivity to LP gas and LP gas can be detected at concentrations of 500-10000 ppm. This sensor has good durability and suitable for the application of marker gas hazards in the home. There is also a LP gas sensor TGS2610-C00 which has a fast response and i that can detect methane gas at a concentration of 500-12500 ppm and CO gas at a concentration 50-1000 ppm. This sensor gas detector is suitable for applications in the home. Carbon dioxide gas sensor that has a wide detection range (350-50000 ppm) and good durability. The sensor is suitable for indoor ventilation control applications and application monitoring CO2 in its manufacture, agriculture, and vehicles. Carbon dioxide gas sensor which has a compact size and low power consumption. This sensor can detect carbon dioxide gas at levels of 350-10000 ppm. Suitable for indoor ventilation control applications and building. Carbon monoxide gas sensor that detects the type of electrochemical gas levels of 0-1000 ppm. These sensors have a long life time and can operate with batteries. Catalytic LP gas sensor type that has a wide detection range (0-100% LEL) and has a linear output. These sensors are suitable for gas hazard marker applications in the home. Catalytic type hydrogen gas sensor which has a wide detection range (0-100% LEL) and has a linear output. The sensor is suitable for the application of Hydrogen gas leak detectors and flammable gas in a fuel cell. Module-based sensor has been calibrated and TGS4160. This module is suitable for indoor ventilation control applications, monitor CO2 gas, and agricultural applications. Module-based sensor has been calibrated and TGS2600. This module is suitable for application control of indoor air quality. Module-based sensor has been calibrated and TGS6812. This module is suitable for gas leak detection applications in fuel cell systems. Sensor module that has been calibrated based TGS2610 with temperature compensation circuit. This module is suitable for the application of gas detectors in the home. Sensor module that has been calibrated based TGS2611 with temperature compensation circuit. This module is suitable for the application of gas detectors in the home. Sensor module that has been calibrated based TGS4161. This module is maintenance free and suitable for indoor ventilation control applications. Oxygen gas sensor Galvanic cell type that is not affected by CO2 gas. This sensor has a long life time and can detect oxygen gas at levels of 0-100%. There are also other types of oxygen gas sensor is KE-50. The oxygen gas sensor for a compact-sized levels 0-30%. This sensor has good linearity and is not affected by CO2 gas.